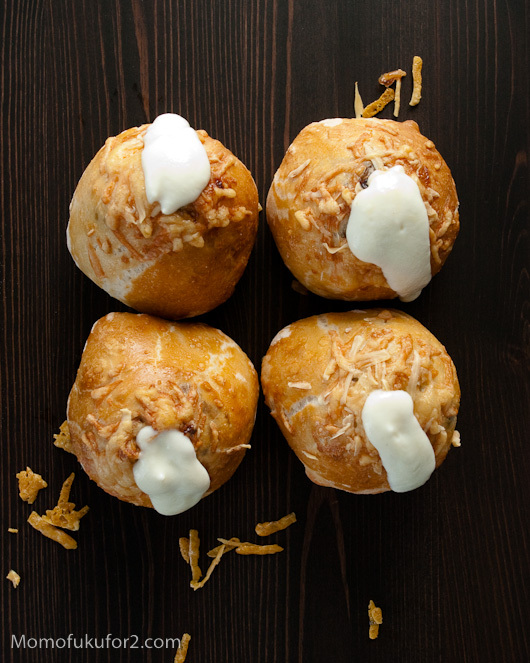 The Momofuku Milk Bar Volcano is scalloped potatoes, bacon, caramelized onions, and Gruyere all wrapped up in a mountainous bun overflowing with calorie-laden Mornay magma. The Volcano sounds all wrong, but it’s oh-so-right. Too heavy, too rich, too much is the general blogosphere consensus; the Volcano is carb overload, for sure, but for me, Atkins is a four letter word and instead of the Volcano conjuring up visions of lava, fire, and fear, I looked upon the Volcano covetingly, with desire and relish. It had to be mine. Luckily, Serious Eats did a Making of the Momofuku Milk Bar Volcano article. The article explores the Volcano’s creation and evolution. There aren’t any recipes, but the step-by-step instructions and photos were more than enough for me to figure out a Volcano for 2. The first step in my Volcano making journey was the scalloped potatoes. Milk Bar does a traditional scalloped potato with pancetta while I went with Thomas Keller’s Ad Hoc potato pavé sans pork products. Leaving out the extra pork might have been a loss, but the crisped up pavé was bonus texture inside the bun. 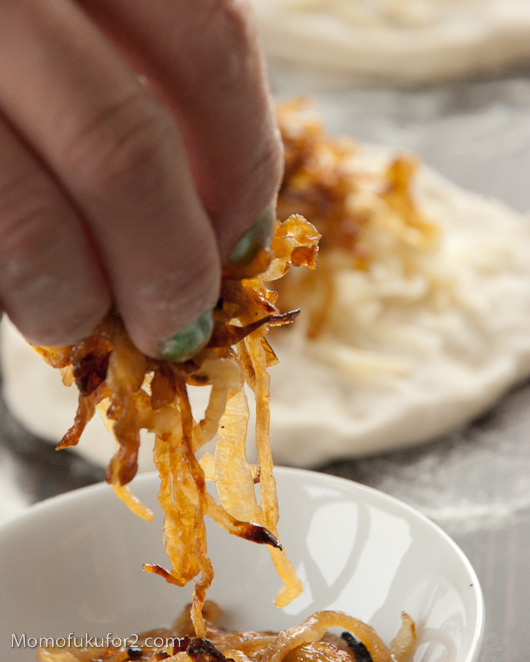 The other ingredients were pretty straight forward: shredded Gruyere, crispy bacon bits and caramalized onions Momofuku-style. The Mornay lava sauce is a basic béchamel with shredded Gruyere mixed in. It’s creamy, calorific and delicious. The Volcano is excellent breakfast or snack fare; it keeps and heats up well, making it excellent hand held grab-and-go food. 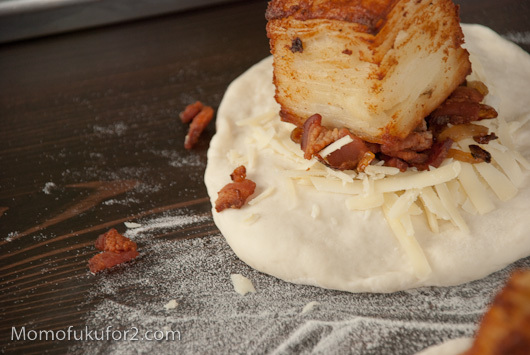 The crispy, cheesy bread goes surprisingly well with the potatoes, the caramelized onions are sweet, and the bacon bits are salty bits of goodness. Now that the four Volcanoes I made are gone, I’m kind of craving more. Is it wrong to be so in love with bread stuffed with potatoes, bacon and cheese? 1. Melt the butter in a sauce pan over medium-low heat. 2. Whisk in the flour and cook for about a minute. 3. Gradually whisk in the milk. 4. Stir constantly until sauce thickens. 5. Stir in Gruyere until melted. 1. Sprinkle yeast on warm water. 2. Stir together salt and flour. 3. Make a well in the flour and pour in yeast and water mixture. 4. 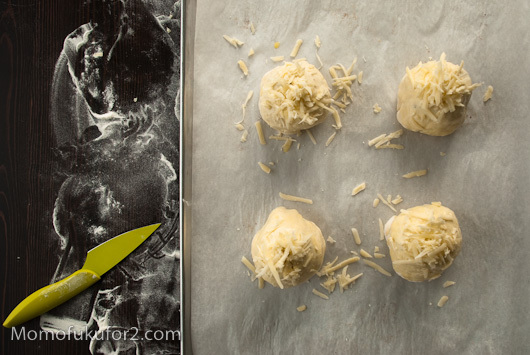 Stir flour and water together into a shaggy ball. 5. 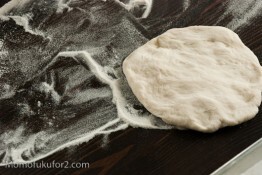 Knead by hand or in stand mixer until smooth and elastic. 6. Put dough in an oiled bowl and cover with saran wrap. 7. 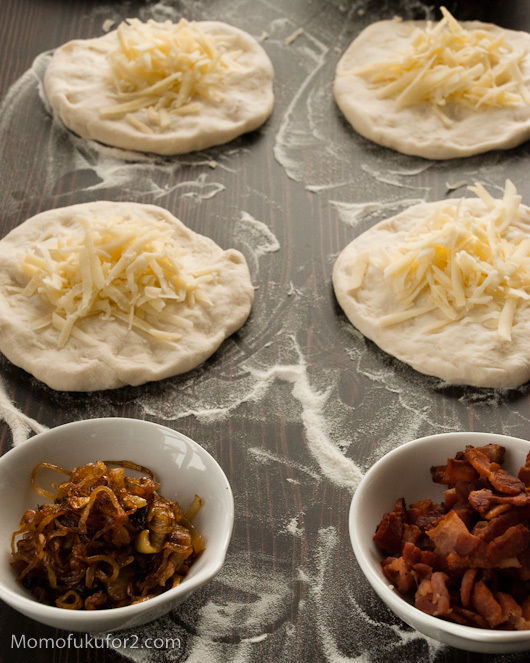 Place in a warm, draft-free spot and let rise for 5 hours. 8. Form four 4 oz balls of dough and cover, let rise for another hour. Note: you will have a bit of dough left over which you can bake into a tiny loaf. 1. 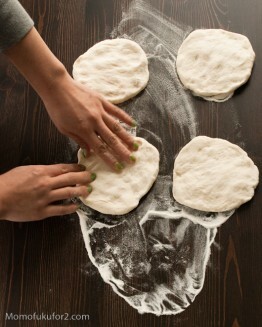 Hand form the four ounce balls of dough into flat, circular disks. 2. Top each disk with about 1/8 cup of shredded Gruyere. 3. Evenly distribute the caramelized onions and bacon bits on the four disks. 4. Place a square of potato pavé on each disk. 5. 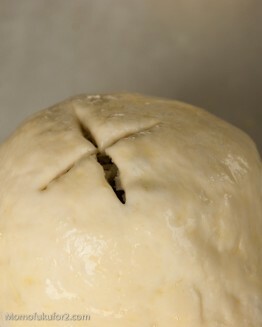 Pull the dough up and around the potato cube in four points and pinch to seal shut. 6. 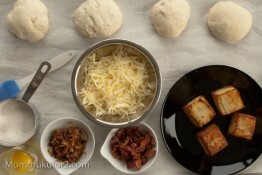 Roll dough into a ball form and turn so that the cheese, onion and bacon are on top and place on baking tray. 7. Whisk egg and brush egg onto Volcanoes. 8. Cut an X into the top of each Volcano as a vent. 9. Top each Volcano with the remaining Gruyere. 10. Bake for 45 minutes or until the Volcanoes are a deep golden brown. 11. Pipe Mornay sauce into the Volcanoes via the X vent. Need and want are two very different creatures…I say you go with want, it’s more fun! Isn’t good evil is so delicious? It’ll be fun for the two of you! Let me know how they turn out! Bookmarked! 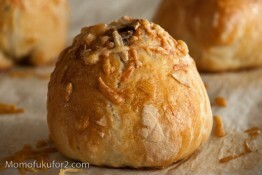 This is so carb overloaded and so good! Thanks for bringing us all the momofuku’s goodness. I am in awe! I don’t know if I can say enough things about how fabulous your site looks now . Also, I would break my detox just so I can eat twelve of these. . . This looks like great Wisconsin food. I’m going to try this with smokey, thick cut Nueske’s bacon. 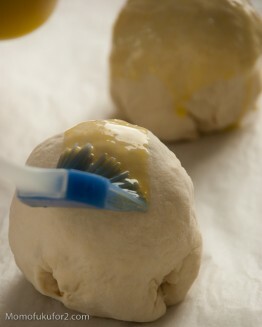 I think I will use docked puff pastry, for a rich and buttery crust too. A saturated fat nightmare, but it will be worth it. Anyway, keep up the great writing! Thanks! I checked out your tumblr site, nice photos of breakfast foods! Happy 100th! 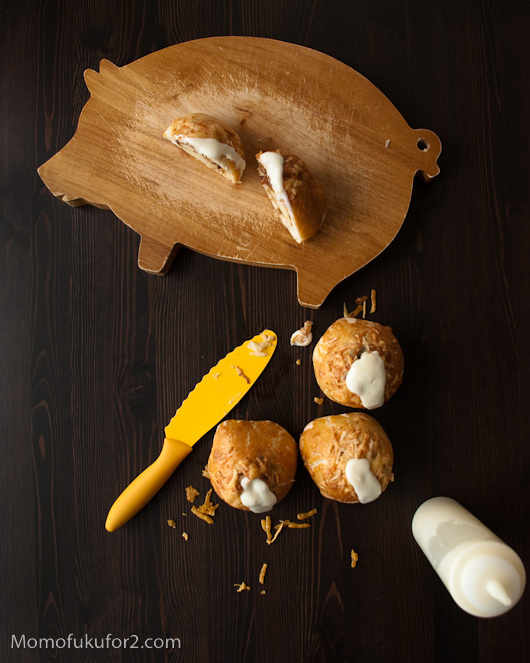 There’s no better way to celebrate than to have some of this momofuku goodness! Thanks Trissa! It’s crazy how much Momofuku goodness there is out there! wow, you made it look amazing even though it still is a carbo overload in my humble opinion. nice work!! Hahaha, yup, it is carb overload! So good though! Wow what an amazing food creation, is it food or art? I think it is both. Congrats on your 100th post, I can’t wait to read thye next 100! Next time I see you, I’ll bring you one! These look beyond amazing! Well done! Oh my god. 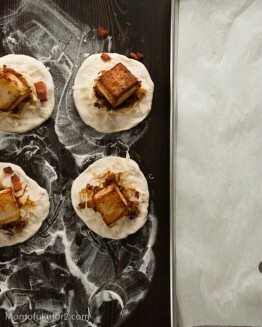 I am so going to make these. Thank you!